USANA, word! : Mike Allsop is ready for The 777 Project! Mike Allsop - USANA Ambassador, Airline Captain, Mountaineer and Adventurer! In 2007, Mike conquered Mt. Everest, the highest and most challenging mountain for mountaineers in the world. And now, Mike is ready for his next challenge – The 777 Project! This amazing athlete will run seven marathons in seven continents in seven days! Suffering from a stress fracture in his lower spine in mid-2012 hasn’t stopped him from his vigorous training and preparation for The 777 Project. 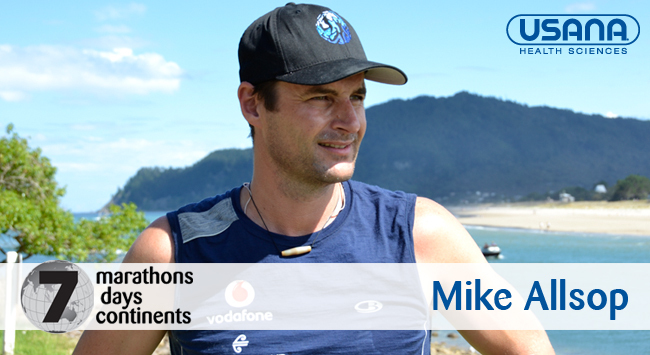 Mike is determined to see this challenge through and USANA is proud to support him the whole way! Here is a little re-cap about what the 777 Project is all about. The 777 Project is a New Zealand first and as Mike progresses on his lengthy journey, we will be able to track his progress via a GPS tracking device – what a neat idea! We can’t wait to celebrate his successes at each leg of the project! The venture will take him to places as diverse as the Falkland Islands, Chile, Los Angeles, London, Casablanca, Hong Kong and back to home soil in Auckland! This will truly be an incredible adventure and we are excited to be a part of it. Mike plans to use The 777 Project to inspire disadvantaged children and to raise money for the children’s charity KidsCan. KidsCan was established in 2005 to support disadvantaged kids’ physical and nutritional needs (an issue very close to our hearts at USANA) in New Zealand. The aim is to help children become more engaged in their education so they have a better chance of reaching their potential in life. As a young boy from a low-income, single parent home, Mike’s dream of becoming a commercial pilot seemed impossible when he was a child. But he has achieved this and a whole lot more. Now, Mike wants to maximise kids’ opportunities to help them fulfil their dreams, too! USANA’s products are great for Mike and they’re a great choice for you too!